An outspoken Vietnamese blogger has been detained at Hanoi’s Noi Bai airport upon his return from a six-month trip to the Philippines and Thailand, where he had met with U.N. human rights officials and advocacy and media groups, friends and fellow bloggers said Wednesday. Nguyen Lan Thang, who began blogging for RFA’s Vietnamese Service last month, told friends by telephone that he had been taken into custody Wednesday night Vietnamese time upon arrival from the Thai capital Bangkok, they said. A day before, he had posted on Facebook a brief video message indicating he expected to be arrested. “Hello my friends! When you see this video, it is certain I have been arrested by the security forces,” he said in the clip. “But don't worry, I will come home to be with you all soon,” said Thang, a fierce critic of Vietnam’s strict media controls. Some 30 friends and fellow bloggers had been waiting for Thang at the airport, fellow blogger La Viet Dung said. “Thang had told us to come pick him up. 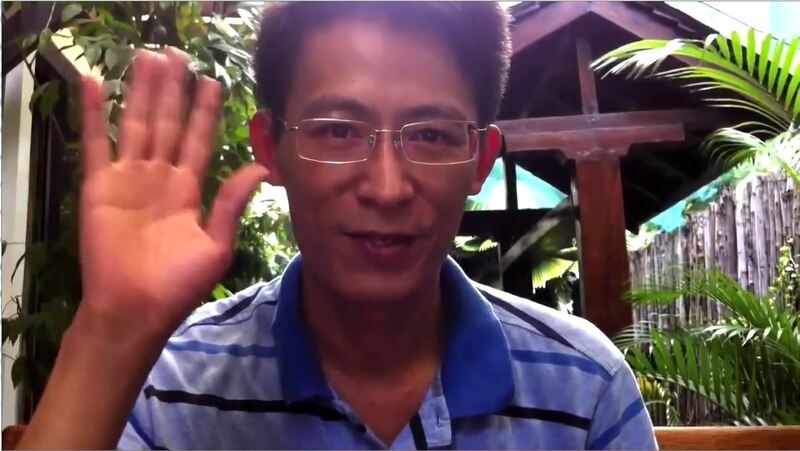 At 8:15 p.m., he called us to let us know that he was detained,” Dung told RFA’s Vietnamese Service. Airport authorities, including immigration officials they were referred to, refused to tell them of Thang’s whereabouts or why he was being held, he said. Thang lives in Hanoi with his wife, who is due to have the couple’s first child in a few months. He had been among a group of Vietnamese bloggers who met with U.N. human rights officials in Bangkok in July to report on rights violations in their home country. The group had presented the officials with a petition, known as Declaration 258, that called for a U.N. Human Rights Council review of Vietnam's treatment of activists and for the elimination of Article 258 of the country's penal code, which prohibits "abusing democratic freedoms" and has been used to jail dissidents. Bloggers Phuong Dung and Thao Chi, who also took part in the July meeting, were briefly detained on their return from Bangkok to Vietnam on August 5, sources said. Following the Bangkok talks, Thang went to Manila with a dozen other young activists for a training stint with a civil society organization in the Philippines before returning to the Thai capital for other meetings. His colleagues who attended the two-week 2013 Civil Society study program with rights organization Asian Bridge Philippines in Manila were held by the authorities for about a day on their return home amid suspicion in Hanoi that they might be involved in anti-government activities, according to friends and family. Aside from Vietnam, ASEAN comprises Laos, Brunei, Cambodia, Indonesia, Malaysia, Myanmar, the Philippines, Singapore, and Thailand. In a video Thang sent to RFA last month, he spoke out against limits Vietnamese authorities place on social media, describing controls placed on those who expose politically sensitive issues such as land grabs and corruption in the one-party communist state. “The social media network is an important tool for me to express my views. At the same time, it has gotten me and those who share my views in trouble,” he said in the video. More than 40 Vietnamese bloggers and activists have been imprisoned so far this year, rights groups say, many of them imprisoned under vaguely worded security provisions. CORRECTION: An earlier version of the story gave an incorrect period of his trip abroad.